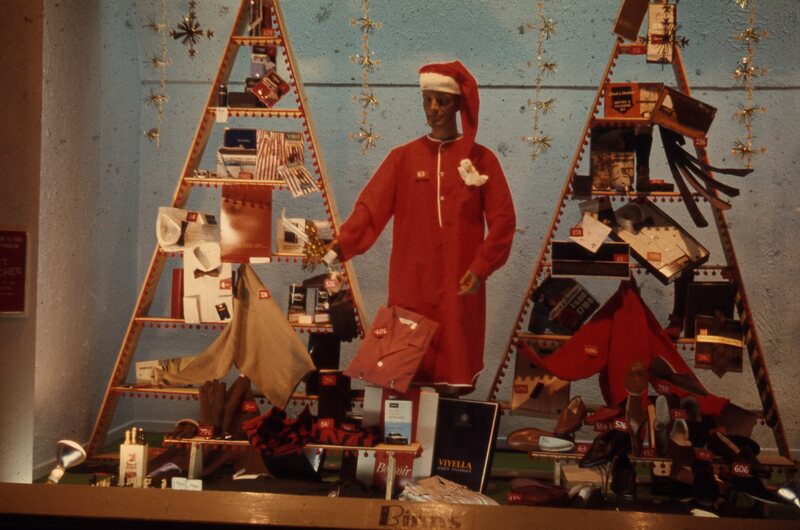 This is a men’s gift display in Binns department store, Newcastle upon Tyne. This is a 35mm slide. It was taken in 1966. 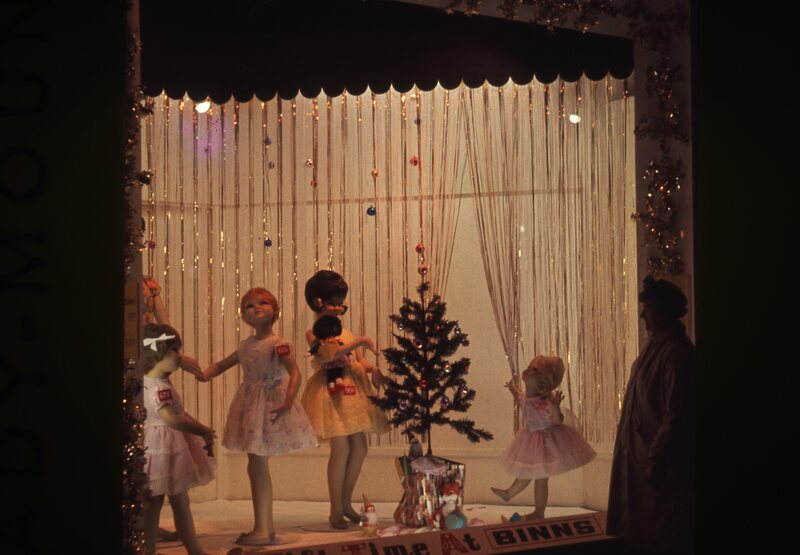 Harking back to Christmas past now, with these photographs of Christmas shop fronts and high street scenes of Newcastle upon Tyne and South Shields in the 1960s. 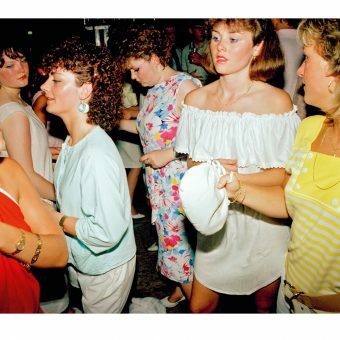 The photos were taken by South Shields amateur photographer Ronald Sanderson and his wife Mabel and given to the South Shields Museum following his death more than 20 years ago. 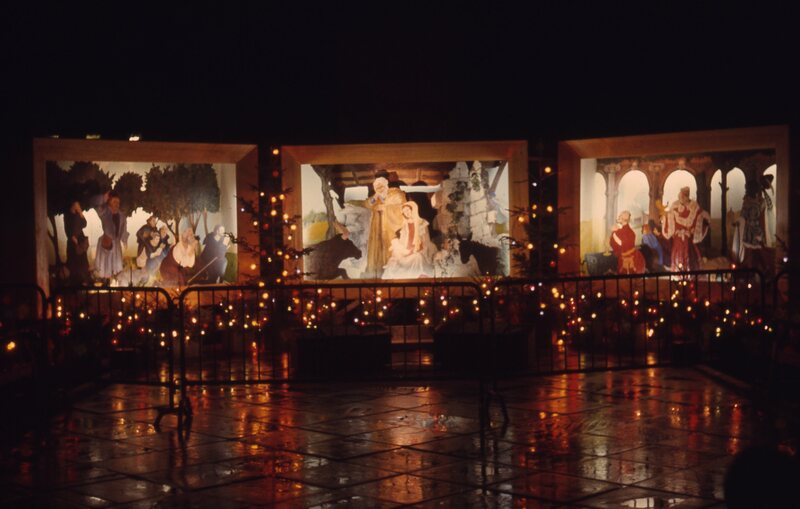 The illuminated, wall mounted Nativity scene in Eldon Square, Newcastle upon Tyne. This is a 35mm slide. It was taken in 1966. 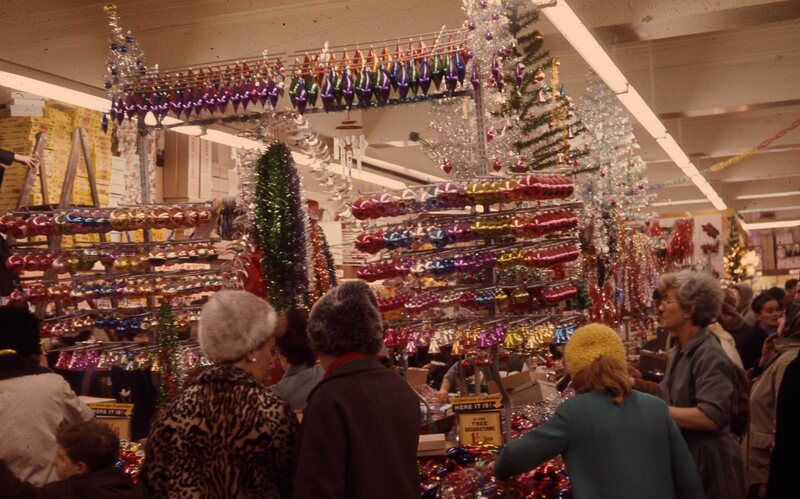 It shows shoppers in the decoration department of Woolworths in Newcastle upon Tyne. This is a 35mm slide. it was taken in 1966. The store cloed in 2008. 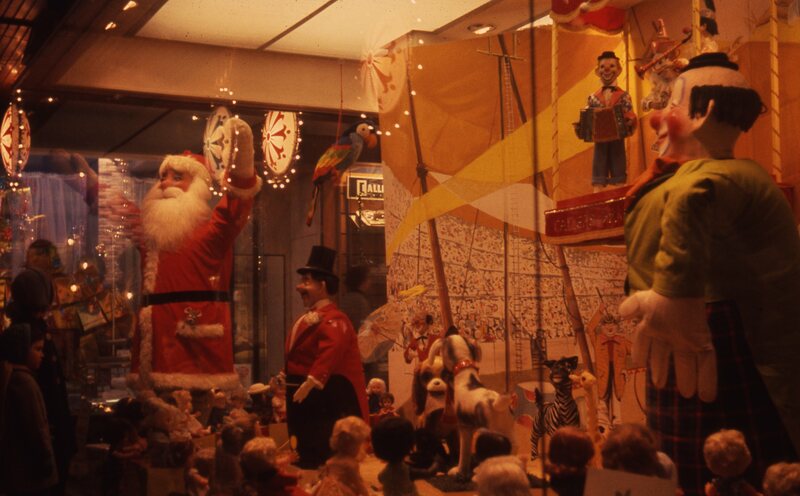 Here is a festive circus scene featuring Father Christmas at Callers department store, Newcastle upon Tyne. This is a 35mm slide. It was taken in 1964. 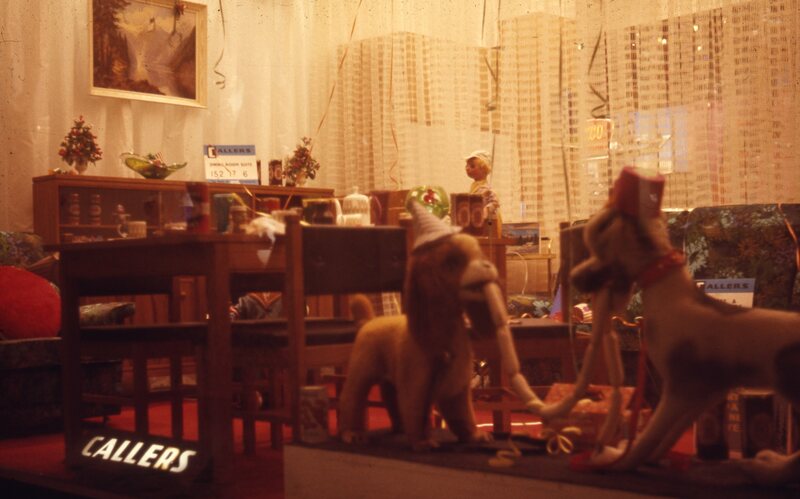 Callers closed in the early 1980s. 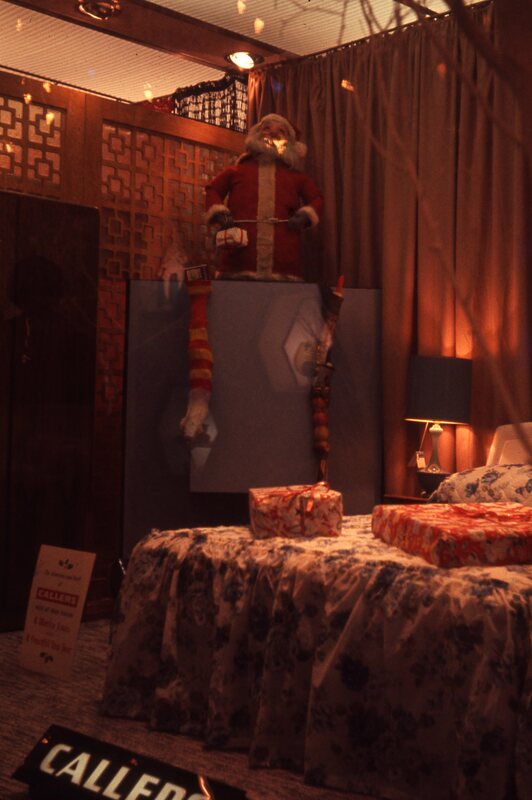 A Christmas display in Callers department store, Newcastle upon Tyne. This is a 35mm slide. It was taken in 1966. 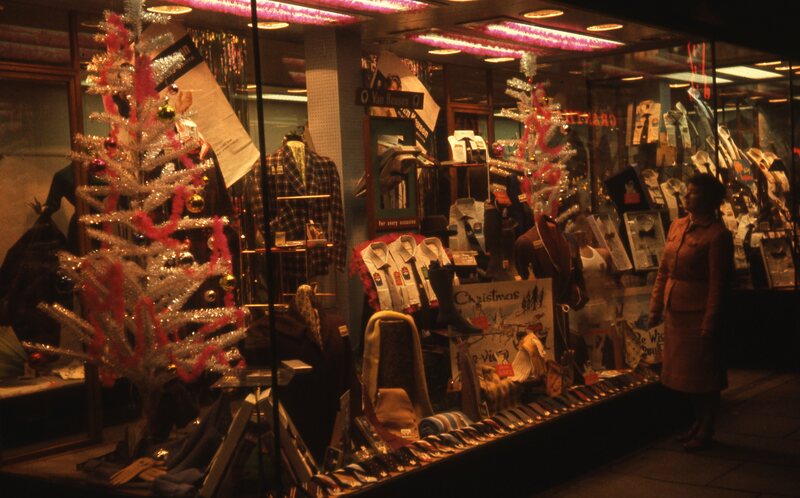 A Christmas display titled ‘The directors and Staff’ at Callers in Newcastle upon Tyne. This is a 35mm slide. It was taken in 1966. 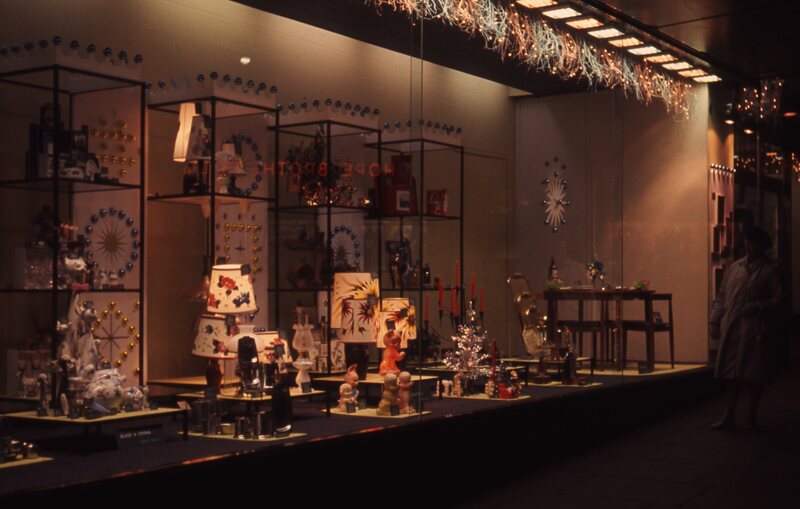 It is a Christmas display in Callers department store, Newcastle upon Tyne. This is a 35mm slide. It was taken in 1966. 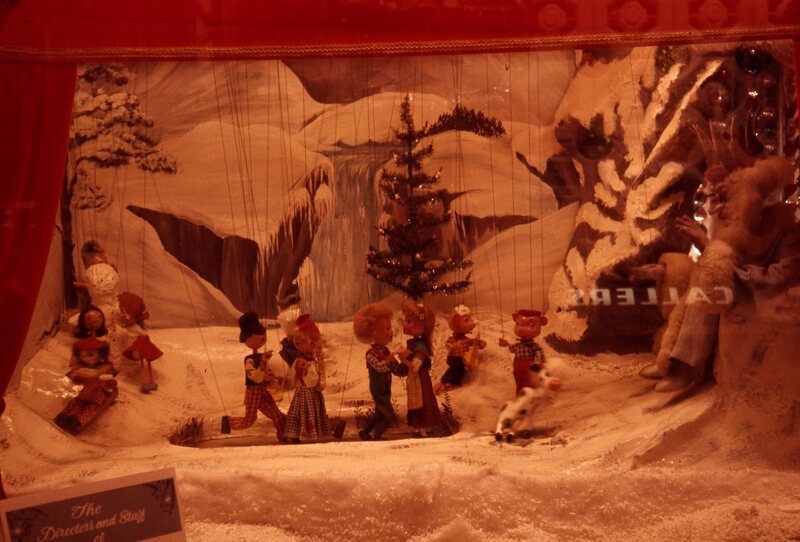 The photograph shows a bear Band in a winter wonderland display at Callers department store in Newcastle upon Tyne. This is a 35mm slide. It was taken in 1966. 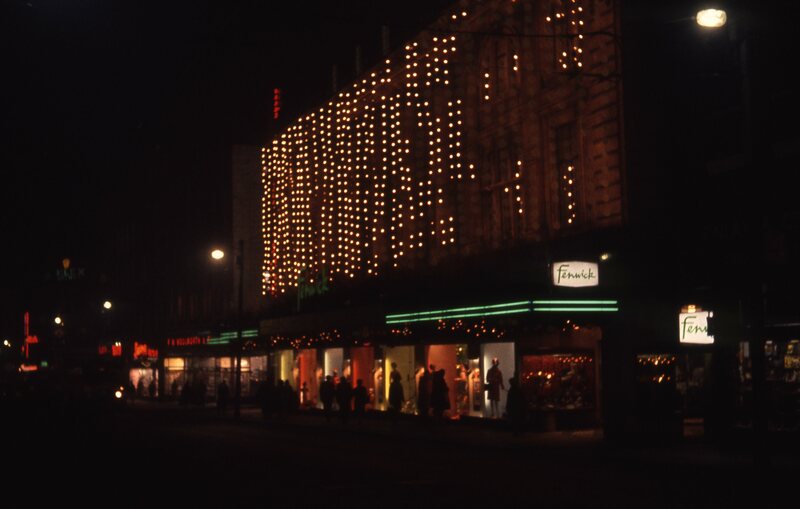 It shows the festive lights of Fenwicks department store in Newcastle upon Tyne. This is a 35mm slide. It was taken in 1964. 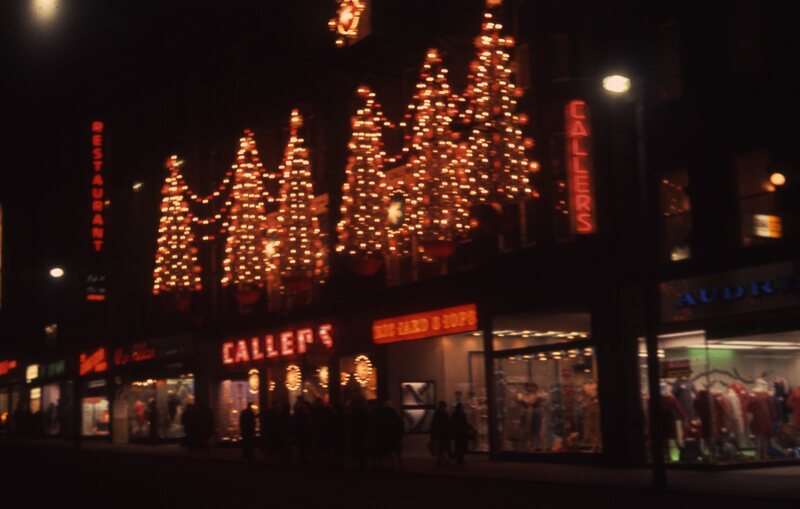 The Callers department store name is spelt out in festive lights. This is a 35mm slide. It was taken in 1964. 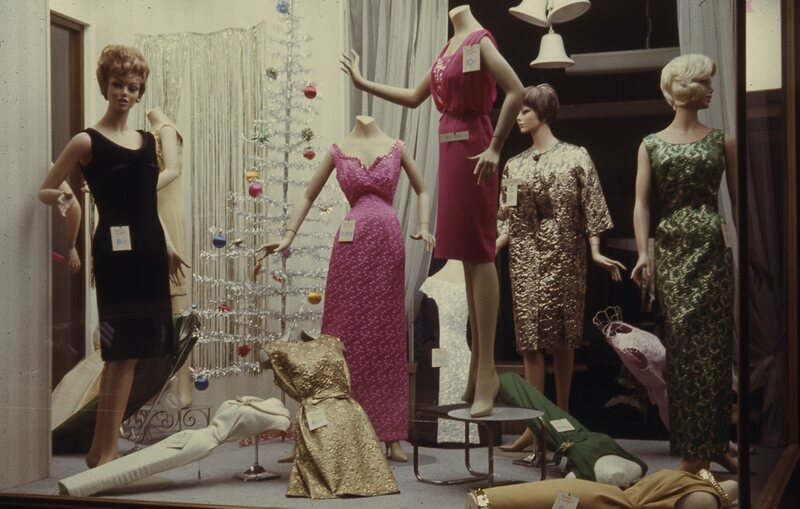 This is a festive window display in Fenwick’s of Newcastle upon Tyne. This is a 35mm slide. It was taken in 1962. 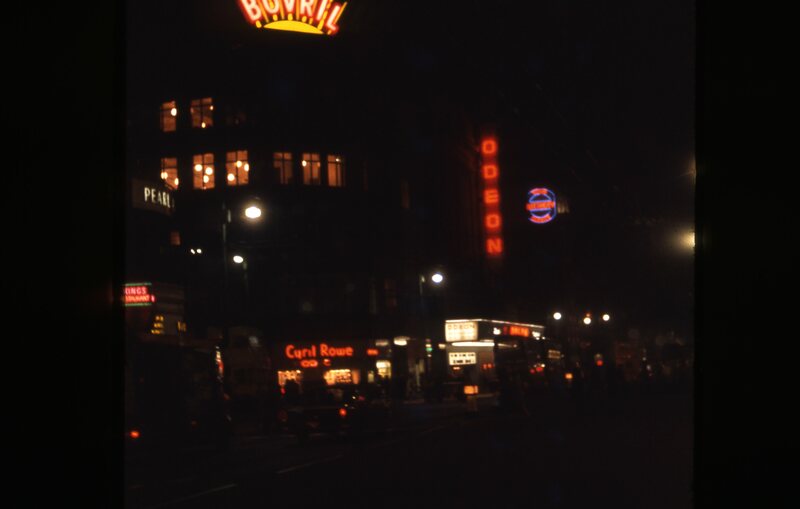 This is a night view of Northumberland street, Newcastle upon Tyne. 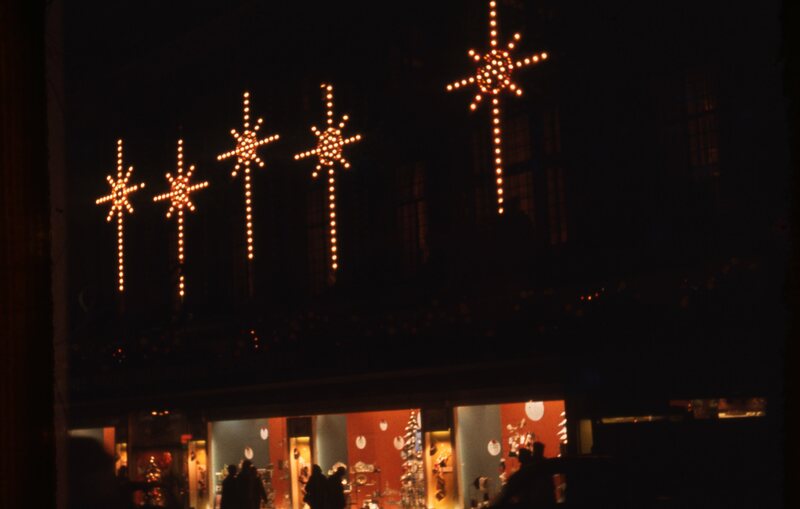 It is illuminated by many festive commercial signs and decorations. This is a 35mm slide. It was taken in 1962. 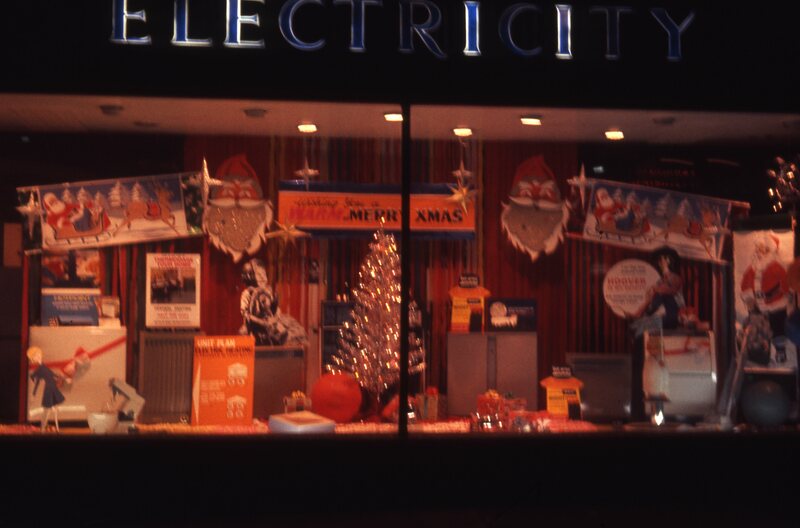 It shows the illuminated and festive window of the Electricity shop in King Street, South Shields. This is a 35mm slide. It was taken in 1963. 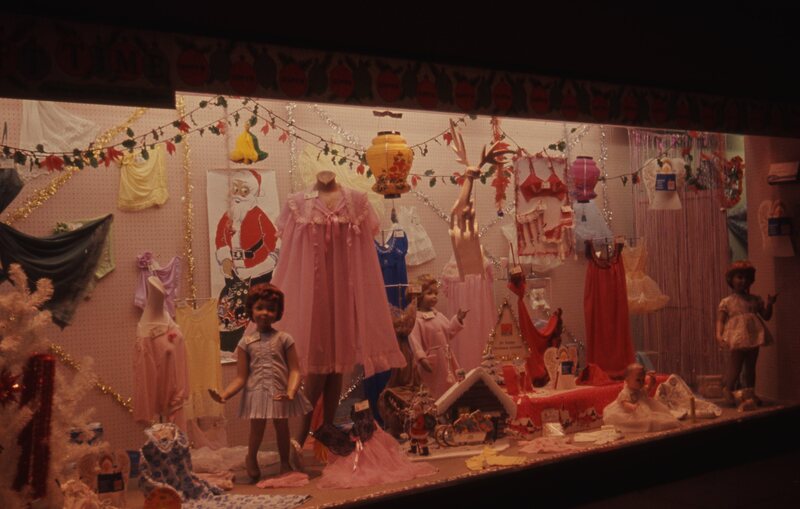 It shows a view of the decorated Christmas window of Bainbridge’s in Newcastle upon Tyne. 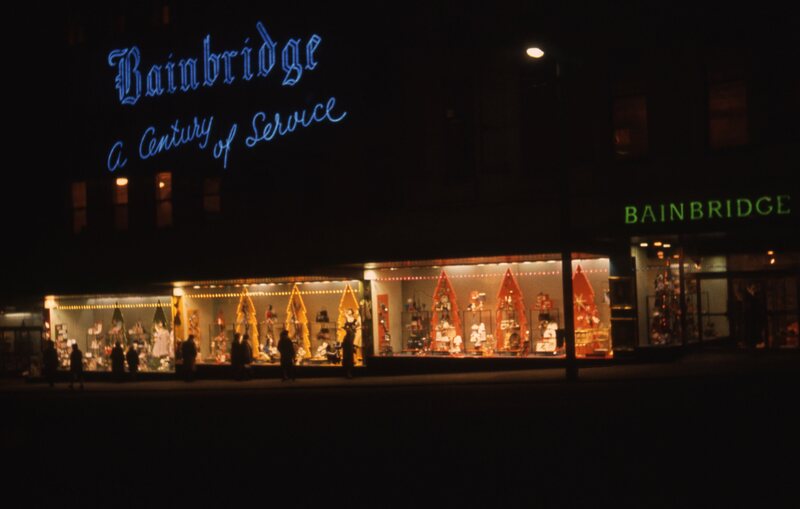 The sign reads “Bainbridge, a century of service.” This is a 35mm slide. It was taken in 1962. The store, which is now branded as John Lewis Newcastle, moved to its current site in 1974, but the company dates back to 1838. 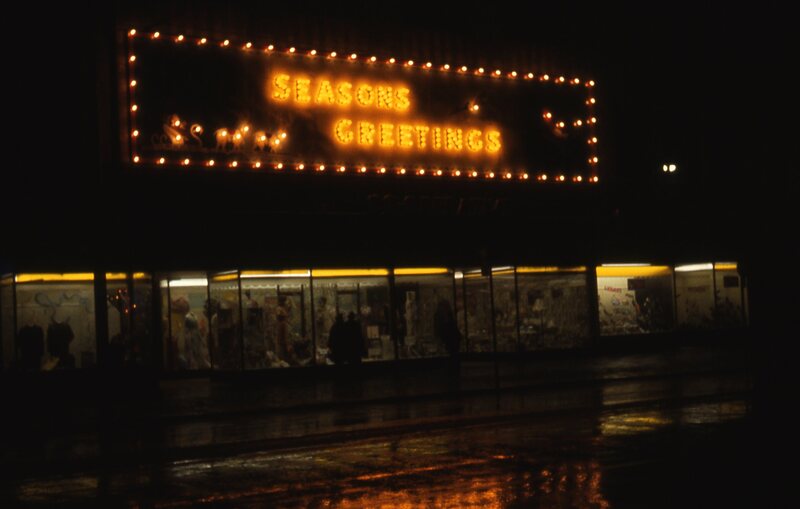 It shows the illuminated Christmas windows of the Westoe Road cooperative store in South Shields. This is a 35mm slide. It was taken in 1962. The site is now a Lidl supermarket. 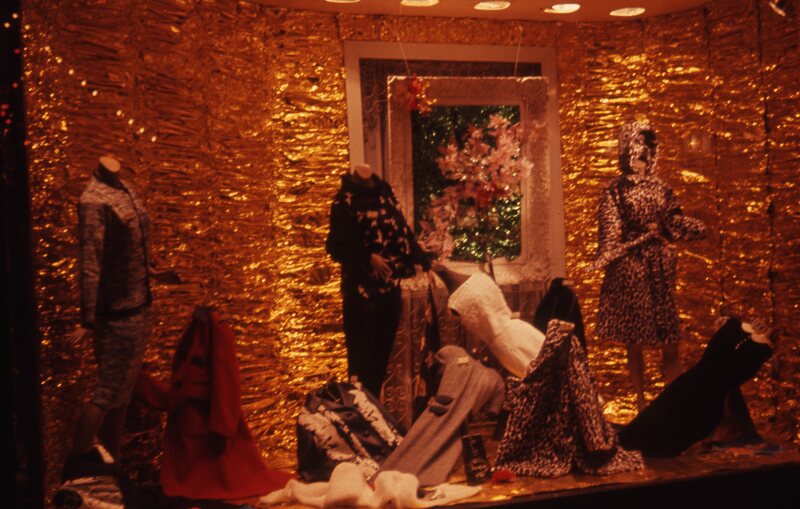 It shows the gift display in a ladies fashion shop on Saville Row, Newcastle upon Tyne. This is a 35mm slide. It was taken in 1966. 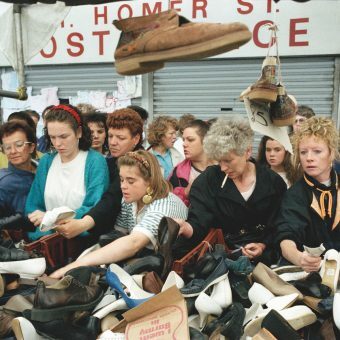 The arcade of Callers store, Newcastle upon Tyne. This is a 35mm slide. It was taken in 1964. It shows the arcade of Callers Store, Newcastle upon Tyne. This is a 35mm slide. It was taken in 1964. 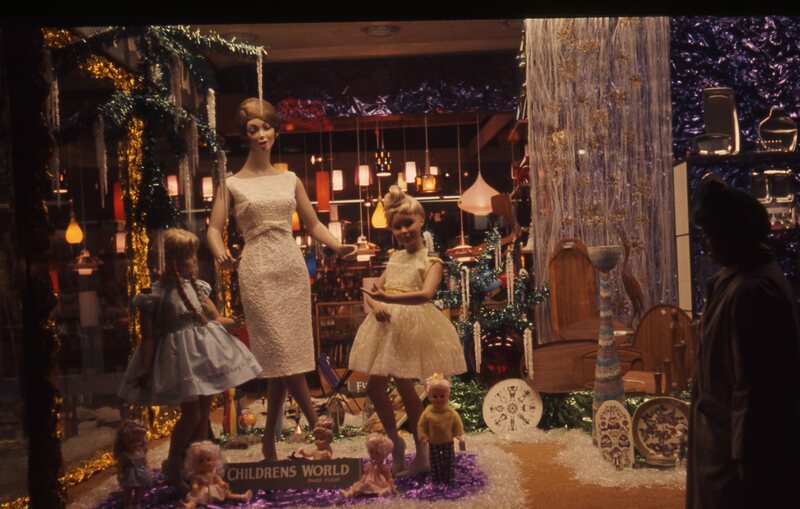 It shows a childrens window display in Callers store, Newcastle upon Tyne. This is a 35mm Slide. It was taken in 1964. 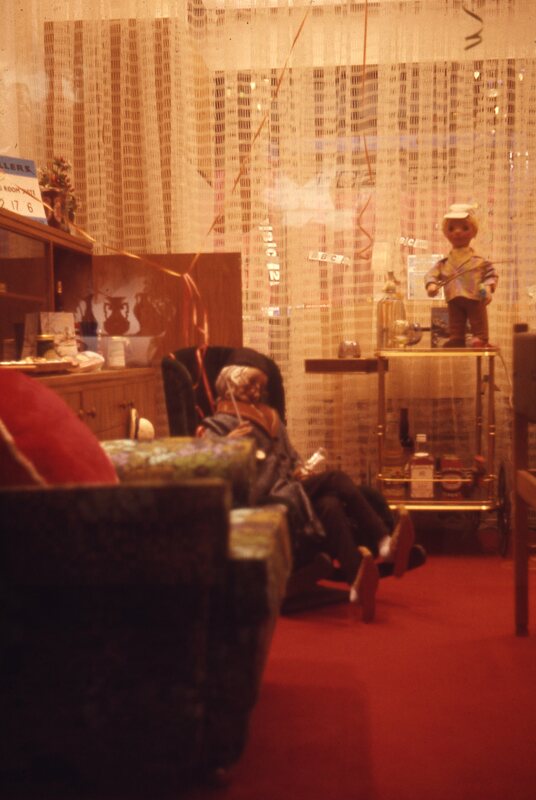 Featuring ‘The old woman who lived in a shoe.’ this is a festive display for children at Callers department store in Newcastle upon Tyne. This is a 35mm slide. It was taken in 1965. Taken in Fenwicks department store in Newcastle upon Tyne, this is a festive Christmas display. This is a 35mm slide. It was taken in 1965. This is a night time view of Binns department store Christmas window in Newcastle upon Tyne. This is a 35mm slide. It was taken in 1965. 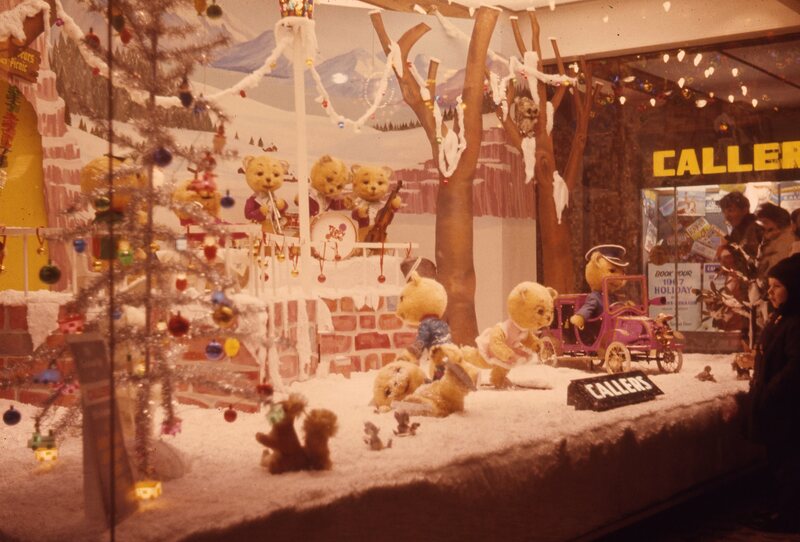 This is the Broadlooms Christmas display window. This is a 35mm slide. It was taken in 1963. 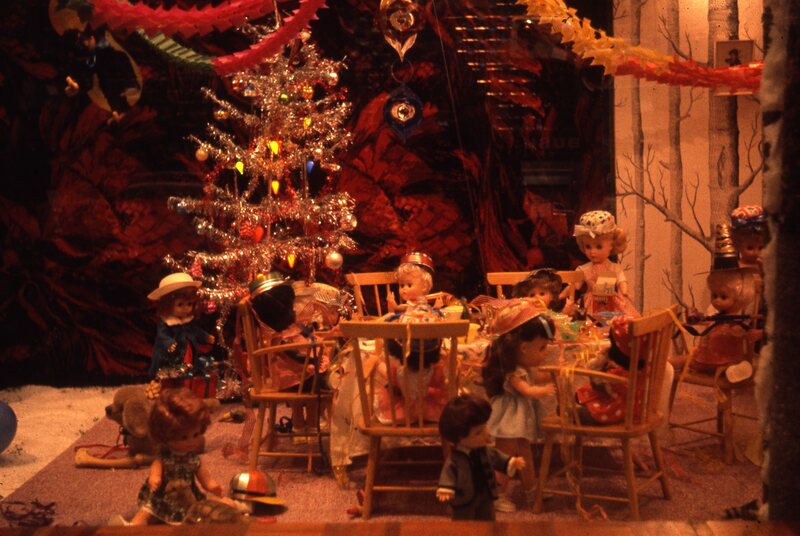 This is a children’s Christmas display at Binns department store, Newcastle upon Tyne. This is a 35mm slide. It was taken in 1963. 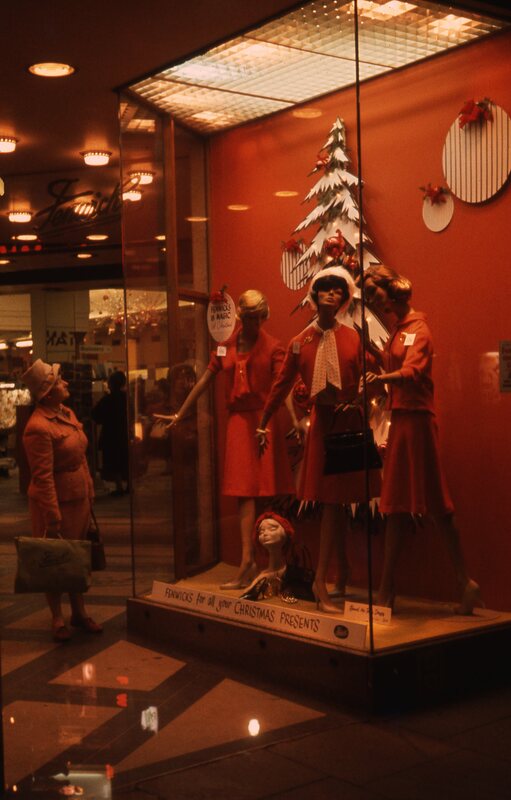 In this photograph shoppers look at the festive displays at Callers department store in Newcastle upon Tyne. This is a 35mm slide. It was taken in 1963. 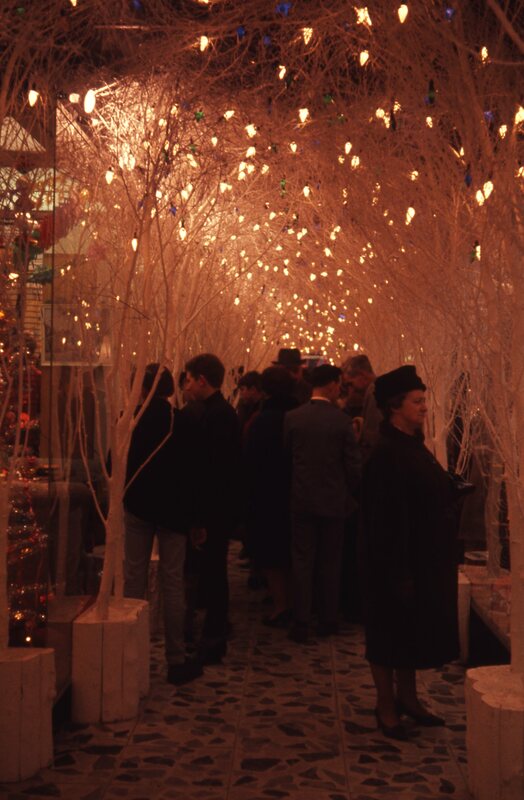 This is a view of the festive display in Callers department store in Newcastle upon Tyne. This is a 35mm slide. It was taken in 1963. 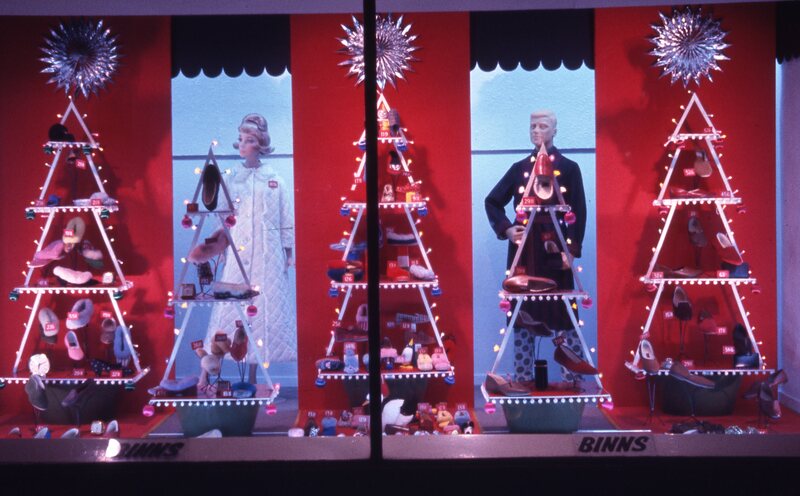 This photograph shows the festive window of Binns department store in Newcastle upon Tyne. This is a 35mm slide. It was taken in 1963. 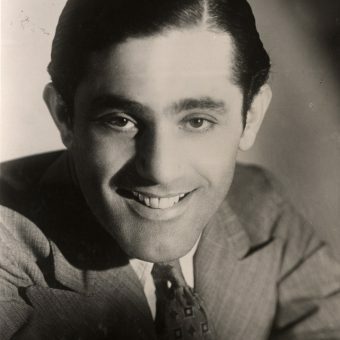 A photograph taken in Binns Department store in Newcastle upon Tyne. 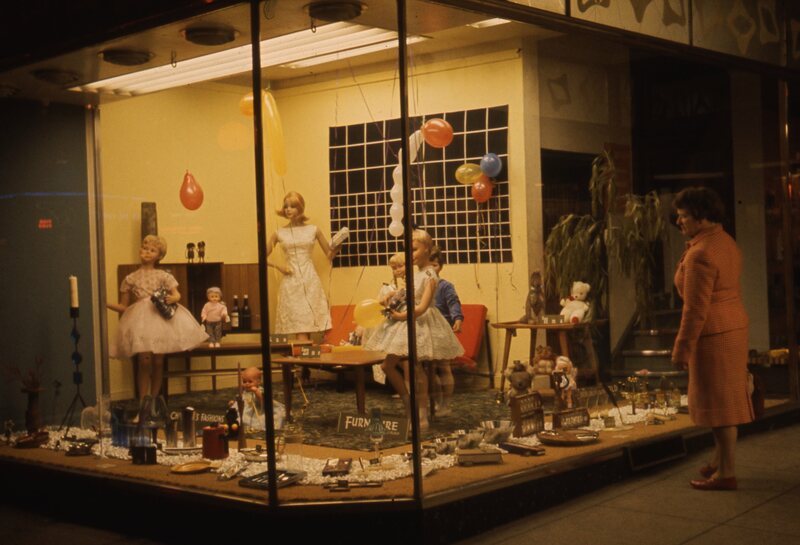 “Gift time at Binns.” This is a 35mm slide. It was taken in 1963. 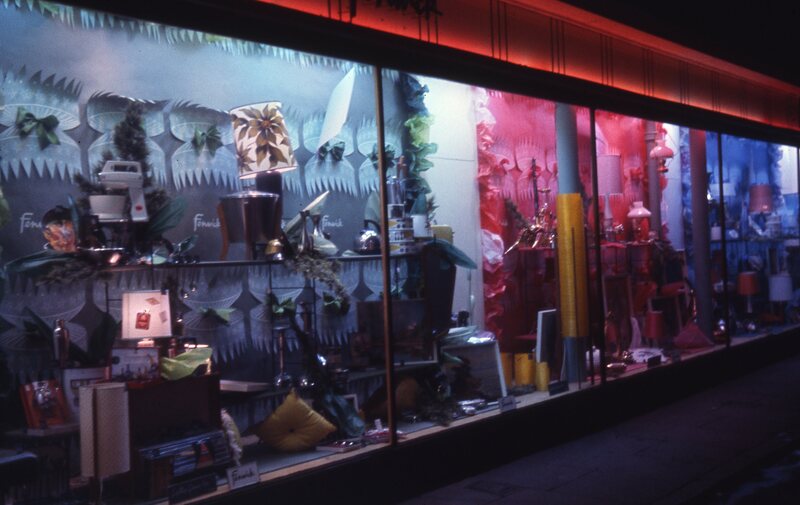 This is a photograph of the illuminated windows of Allen’s department sore in South Shields. This is a 35mm slide. It was taken in 1963. 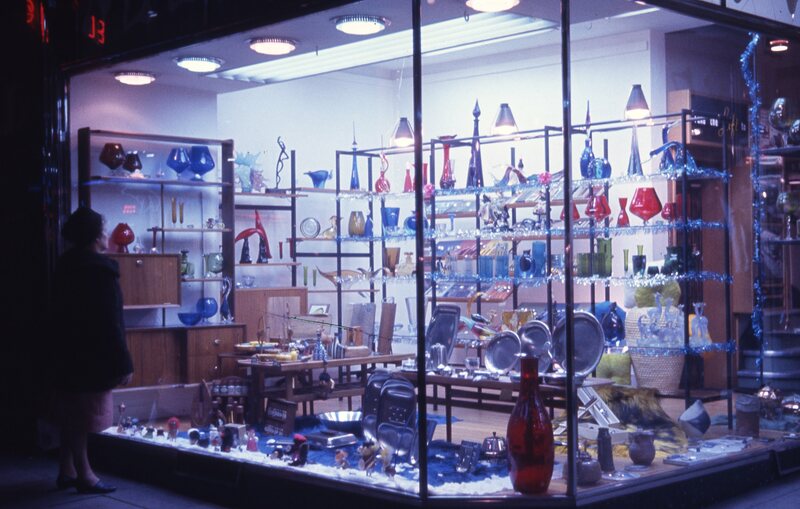 This is the window of Waring and Gillow, Newcastle upon Tyne. This is a 35mm slide. It was taken in 1963. 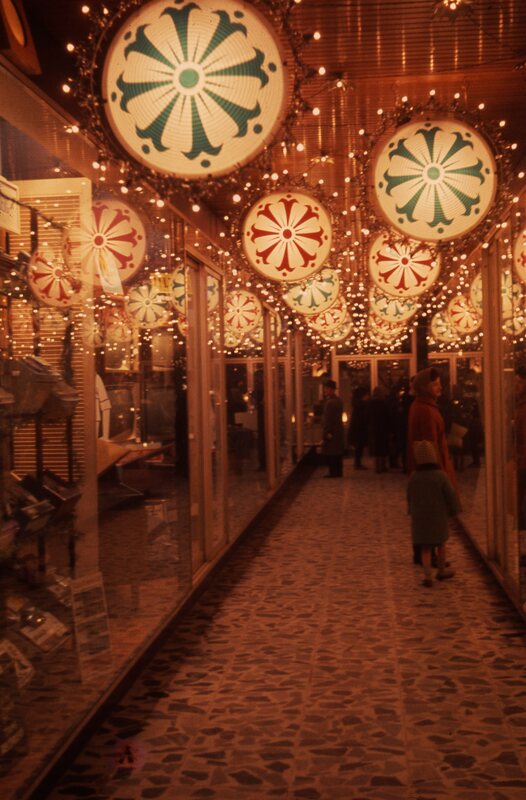 The photograph shows the illuminated Christmas window of Glassburg’s shop in Fowler Street, South Shields. This is a 35mm slide. It was taken in 1963. 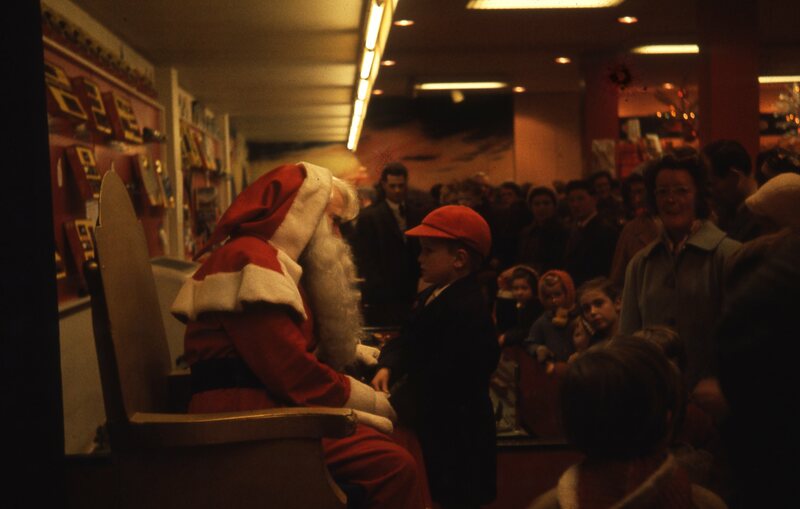 This photograph shows children as they meet Father Christmas in Santa’s Grotto, Fenwicks department store. This is a 35mm slide. It was taken in 1962. 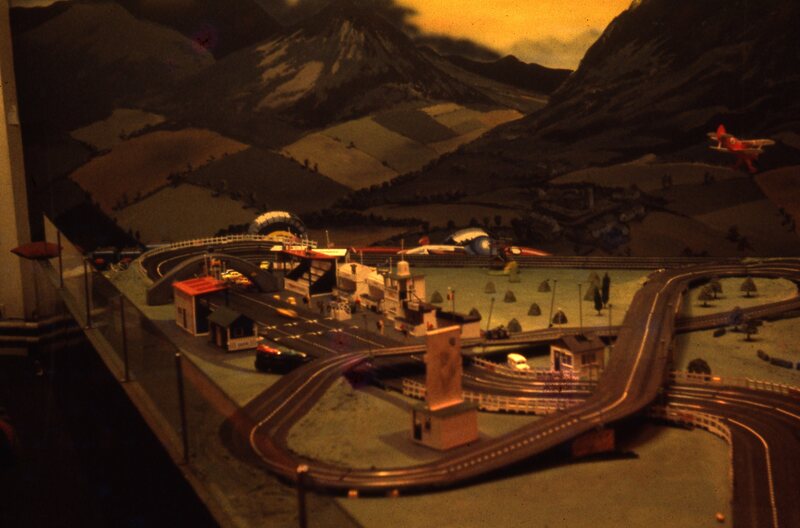 A Scalextric racing kit is displayed in Fenwicks Toy department at Christmas time. This is a 35mm slide. It was taken in 1962. 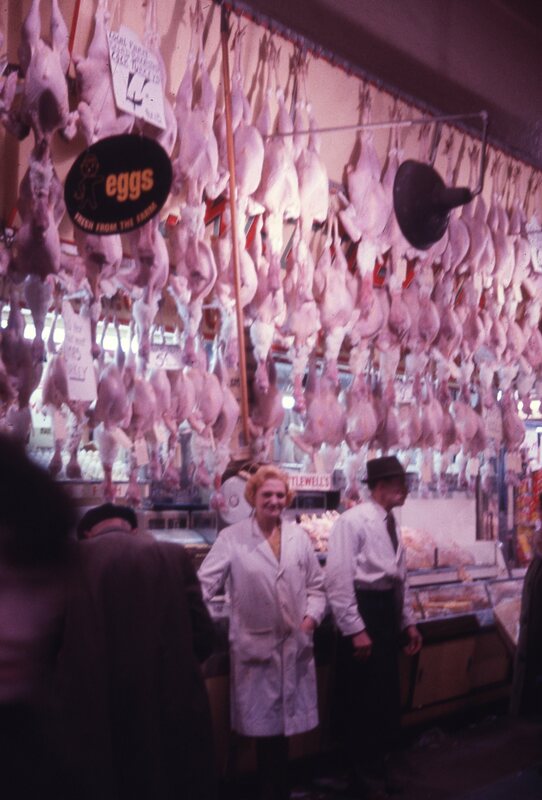 A poultry store in Newcastle upon Tyne displays its goods and one of its workers. This is a 35mm slide. It was taken in 1965. 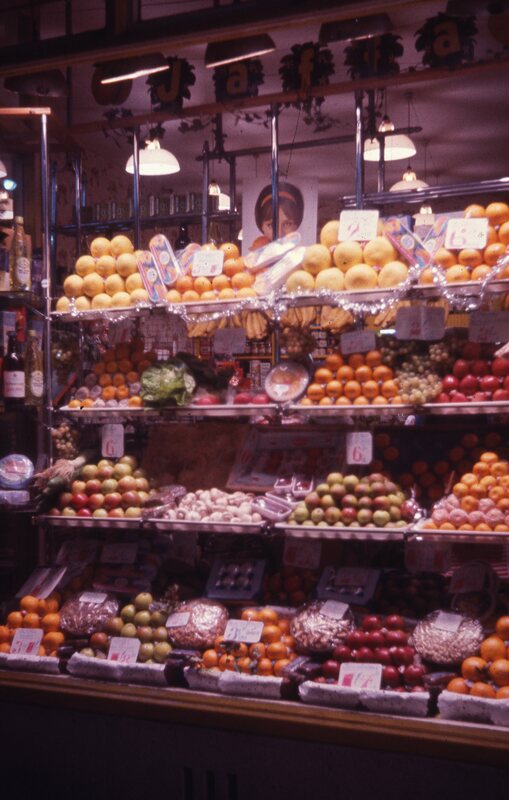 A Fruit and Veg display, taken somewhere in Newcastle upon Tyne. This is a 35mm slide. 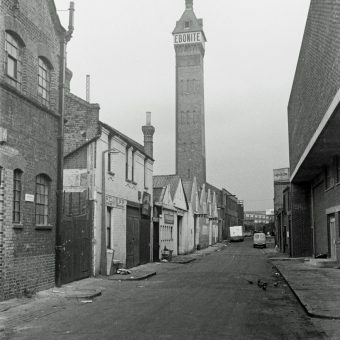 It was taken in 1965. 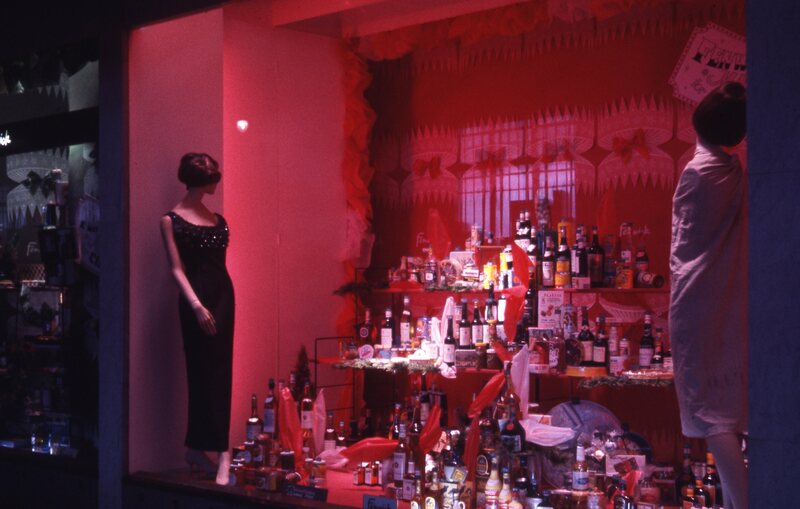 A festive display at Fenwicks department store shows a variety of bottled christmas spirits, Newcastle upon tyne. This is a 35mm slide. It was taken in 1965. 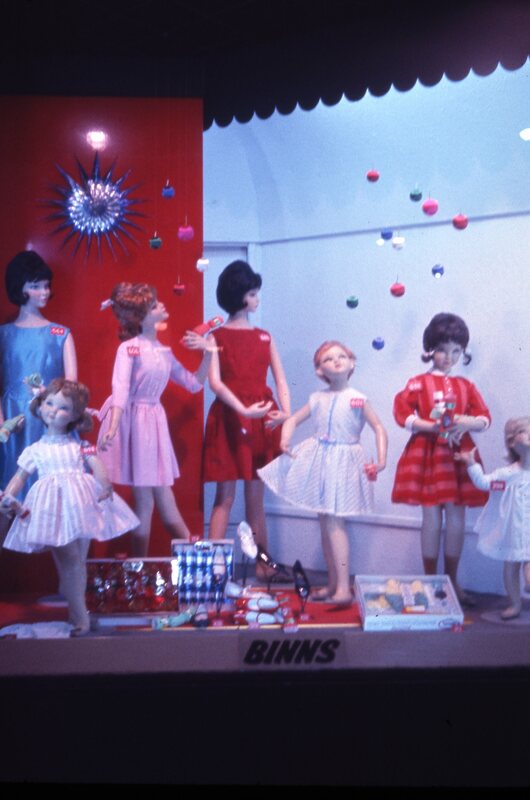 This is a colourful display in Bainbridge’s department store, Newcastle upon Tyne. This is a 35mm slide. It was taken in 1965. 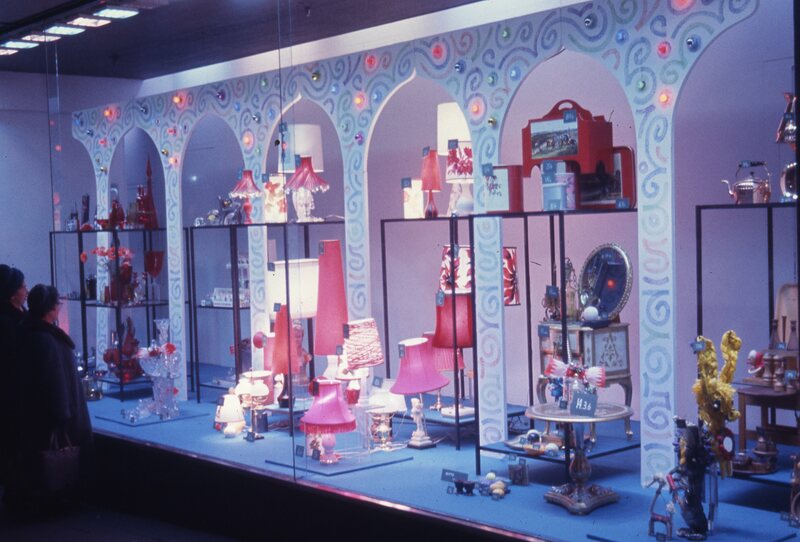 This shows the illuminated window of Bainbridge Department store, Newcastle upon Tyne. This is a 35mm slide. 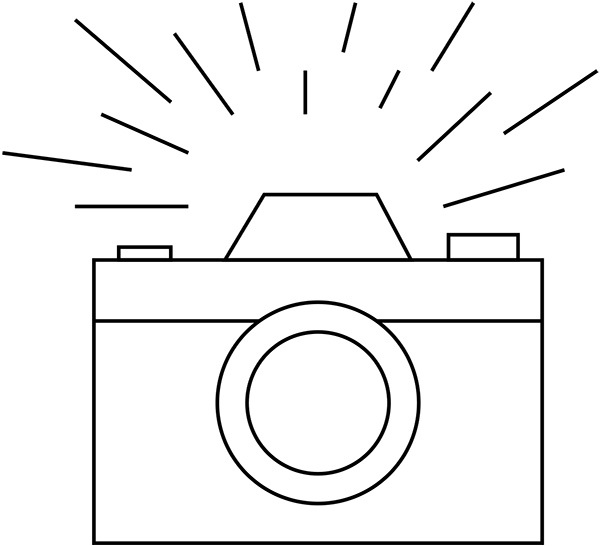 It was taken in 1963. 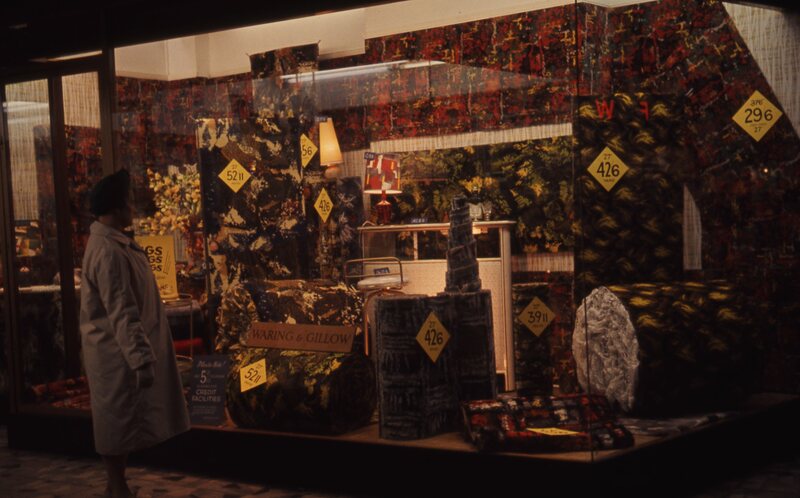 This photograph shows the window of the Broadloom Mills shop in Newcastle upon Tyne, Grey Street. This is a 35mm slide. It was taken in 1963. 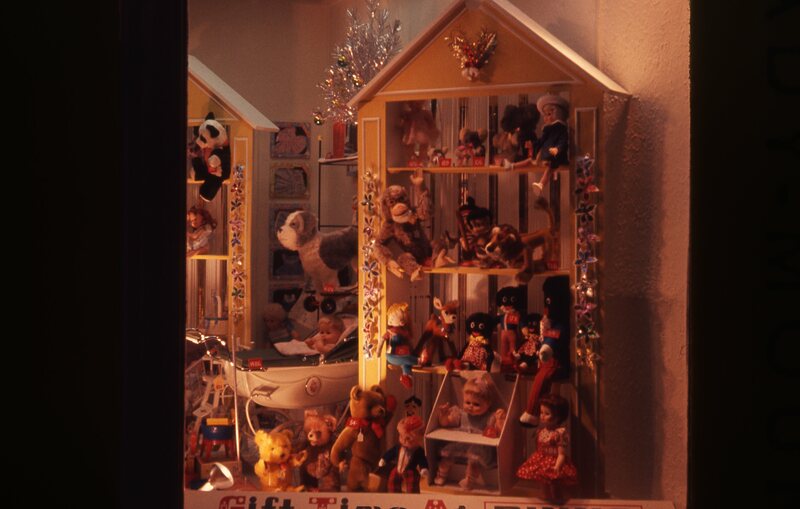 This photograph shows the display for ‘Fenwicks, for all your Christmas presents.’ in Fenwicks department store in Newcastle upon Tyne. This is a 35mm slide. It was taken in 1962. 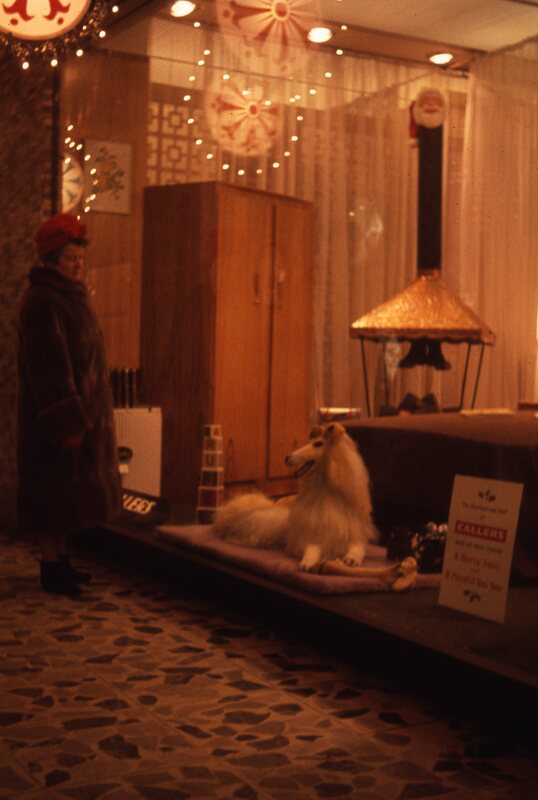 This is a festive window of the Broadloom Mill shop in Grey Street, Newcastle upon Tyne. This is a 35mm slide. It was taken in 1962. 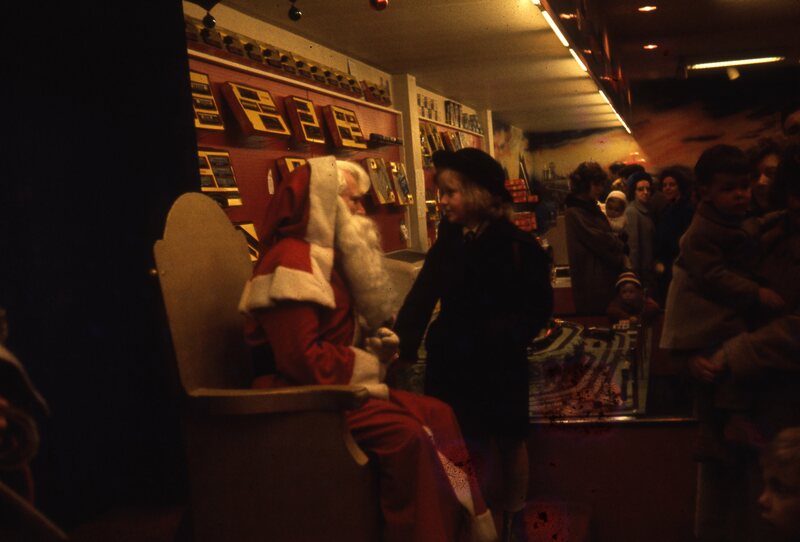 This photograph shows Santa’s Grotto in the Fenwick department store in Newcastle upon Tyne. 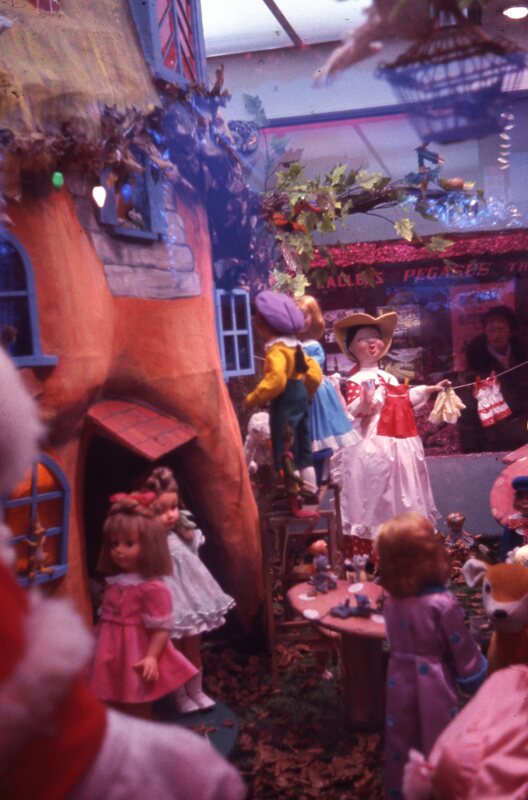 Children and their parents wait to meet Father Christmas. This is a 35mm slide. It was taken in 1962. This is the decorated Christmas window of the Woods store in South Shields. This is a 35mm slide. It was taken in 1962.